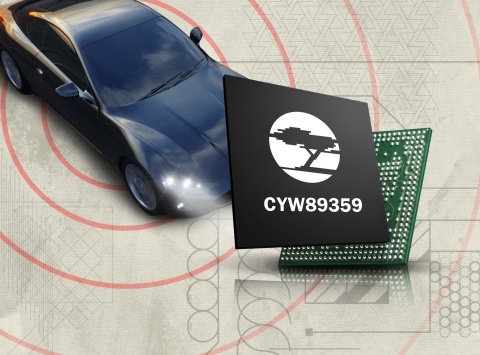 NUREMBERG, Germany--(BUSINESS WIRE)-- EMBEDDED WORLD — Cypress Semiconductor Corp. (NASDAQ:CY), the leader in advanced embedded solutions, today announced that e.solutions GmbH, a joint venture of Audi and Elektrobit, has integrated Cypress' wireless connectivity solution into its design for new in-vehicle communication units, including in the 2018 Audi A8. Drivers and passengers have the ability to connect up to eight devices at once to the Alpine communication unit's Wi-Fi® hotspot leveraging Cypress' 802.11ac and Bluetooth® combo solution. As the software stack and design and development supplier of the communication unit, e.solutions selected Cypress' solution to achieve maximum performance. The solution is the industry's first to implement Real Simultaneous Dual Band (RSDB) technology which enables two unique data streams to run at full throughput simultaneously by integrating two complete Wi-Fi subsystems into a single chip. Cypress is demonstrating its next-generation automotive wireless connectivity solution, along with its complete embedded systems solution portfolio, at the Embedded World trade show in hall 4A, stand 148 of the Nuremberg Exhibition Center from February 27 to March 1. "The dynamic infotainment user experience enabled by e.solutions design illustrates how our wireless combo solutions pave the way for connected cars," said Sudhir Gopalswamy, senior vice president of the Microcontrollers and Connectivity Division at Cypress. "The design also demonstrates the opportunity we are seeing for new semiconductor content in vehicles as automakers increasingly use in-cabin electronics to enhance the user experience. Beyond the automotive market, it shows how Cypress is partnering with our customers to solve their design problems and bring their innovative ideas to market." The e.solutions communication unit design uses Cypress' CYW89359 combo solution, which includes an advanced coexistence engine that enables optimal performance for dual-band 2.4- and 5-GHz 802.11ac Wi-Fi and dual-mode Bluetooth/Bluetooth Low Energy (BLE) simultaneously for superior multimedia experiences. Its RSDB architecture enables applications such as Apple CarPlay and a Wi-Fi hotspot to operate concurrently without degradation caused by switching back and forth between bands. More information on Cypress' RSDB and 802.11ac combo solutions is available at www.cypress.com/802.11ac. Cypress works with the world's top automotive companies to develop leading-edge automotive systems, including Advanced Driver Assistance Systems (ADAS), 3-D graphics displays, wireless connectivity, full-featured touchscreens and superior body electronics. Cypress' automotive portfolio includes the Traveo™ and PSoC® MCUs, power-management ICs (PMICs), CapSense® capacitive-sensing solutions, TrueTouch touchscreens, NOR flash, F-RAM™ and SRAM memories, and Wi-Fi®, Bluetooth® and USB connectivity solutions. The portfolio is backed by Cypress' commitment to zero defects, excellent service and adherence to the most stringent automotive industry standards. Learn more at www.cypress.com/automotive.